As is tradition, Gustavus Adolphus College packed Christ Chapel for five services in three days as part of the College’s 42nd annual Christmas in Christ Chapel, “Tender Rose, Starry Night”. For the first time this year, the College produced a live stream of the Saturday evening service so that alumni and friends of the College all around the world could enjoy this holiday tradition from the comfort of their own homes. The live stream was extremely successful as more than 7,500 people tuned in from 24 different countries and 49 different states. Heroic Productions, which annually provides audio, video, and lighting solutions for both Christmas in Christ Chapel and the Nobel Conference, produced the live stream with the use of nine different cameras. A tradition since 1973, Christmas in Christ Chapel is a time for the Gustavus community to celebrate the holidays with one another through music, dance, spoken word, and prayer. Approximately 350 students, faculty, and staff bring the program to life each year through the use of music and visual art. A new theme is chosen each year in order to educate participants and audiences alike about faith and cultural traditions. 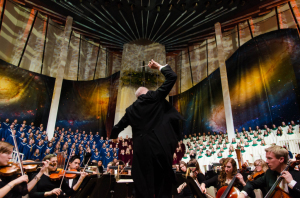 Choirs and orchestras lead the five services, with approximately 1,200 people attending each one.